EARTH Blue Edition was the concept and brainchild of Millennium House’s Managing Director, Gordon Cheers. 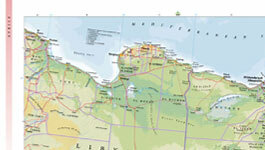 It has been a 20-year professional dream of Cheers to create an atlas this large and detailed. Previous employers and countless sceptics were adamant that an atlas of this size could never be produced and successfully sold. So Cheers established his own publishing company, Millennium House, and after two years of production EARTH Blue Edition finally arrived. It took 20 years of planning and two years of production before EARTH Blue Edition was ready to purchase. It has taken tens of thousands of man-hours, 35 computer crashes, 350,000 words, over 800 images and 170 full-page maps, to produce ththis amazing atlas. 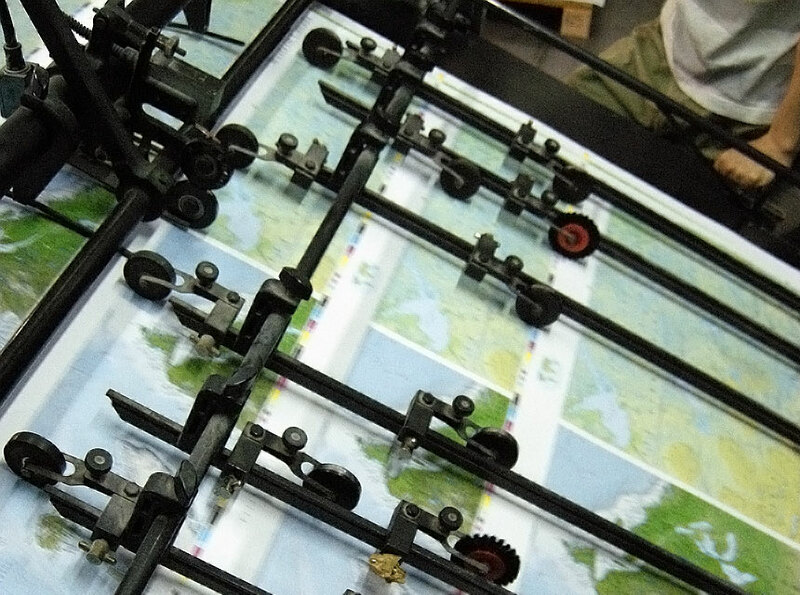 The construction of EARTH Blue Edition 170 full-page maps involved 100 of the world’s best cartographers and oceanographers, as well as a team of over 50 editors. Each map began as a blank grid before intricate details were continuously layered on top of one another, slowly building up the leatures of our planet. Place names, ranging from country names to rivers and other physical features, were then plotted across all the maps before the editors checked each name for correct spelling and location. Their corrections were made and checked again before the final maps were completed and the place names listed in the 128-page gazetteer. 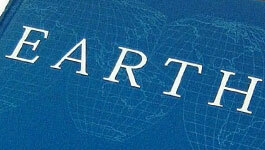 Over 100 contributors and experts from across the world were selected to write the 194 country profiles and text for the pages of EARTH Blue Edition. Once the original text was written, it was edited and formatted so that each spread included text and photographs, as well as small country maps, diagrams and fact files for each of the countries presented. Over 800 images were carefully selected from prestigious picture libraries—presenting some of the most stunning representations of each country. The sheer weight and size of EARTH Blue Edition meant that printing was deemed a nearly impossible task. 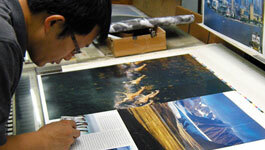 Each book was printed and painstakingly bound by hand to ensure its longevity. Special techniques were also employed to aid preservation, including the sealing of the page edges with gilding. Each copy is carefully wrapped and secured for delivery, so that your copy will arrive in perfect condition, and will remain that way for years to come. After your order has been received, each individual copy is packaged and delivered to your door. 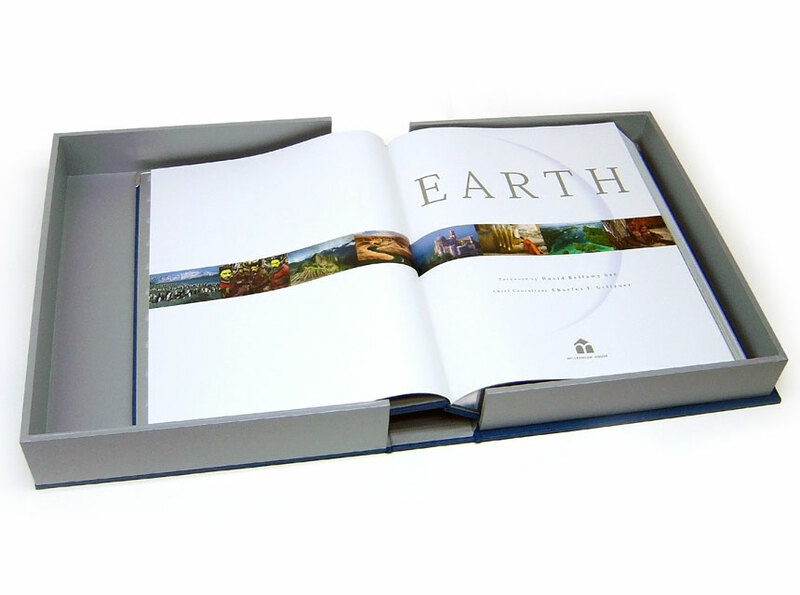 The layers of packaging will protect the atlas throughout the delivery process, while the preservation box will safely house the book when not in use. Numerous prototype covers and display boxes were trialled before finally deciding on the perfect storage and presentation elements. The collection includes two versions—2,000 copies of the Royal Blue edition and 1,000 copies of the Imperial Gold edition. Each copy is numbered and accompanied by a Certificate of Authenticity signed by Millennium House's Managing Director, Gordon Cheers.